2007 Oh no!!! Not again! In which I practise the vault over top the hood of a Buick. It never starts out to be a lousy day, and in point of fact, barring the collision and associated events, it was a great day to be out on two wheels and with my friends. The route was going to be circuitous and far longer than a cager would feel necessary, but it's not the destination so much as how you get there. Hamming it up because I can. Continue Reading » 2007 Oh no!!! Not again! In which I practise the vault over top the hood of a Buick. An accident involving a deer and four motorcyclists on Highway 404 led police to close the southbound lanes until around 11:30 p.m. 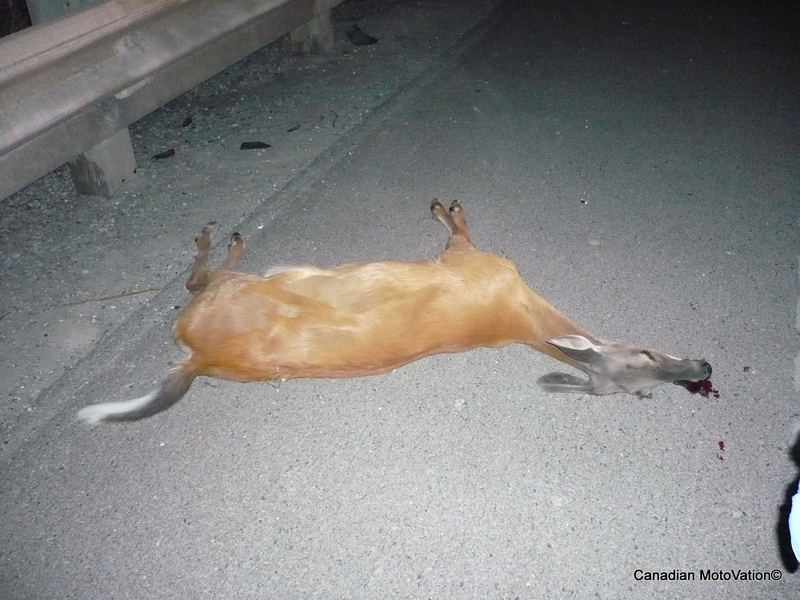 The accident occurred when a deer wandered into the highway near Davis Dr., said Sgt. Rob Michaud with Ontario Provincial Police. One of the motorcyclists hit the deer, which was killed. The motorcyclist was taken to hospital to be treated for non life-threatening injuries, while the other motorcyclists were treated on scene.